Georgia Skyers is a Master’s prepared Nursing Executive with 23+ years of nursing experience. She entered the world of nursing at the tender age of 17 after graduating high school with a diploma and an LPN license. Her areas of expertise are in Operations, Critical Care, and Maternal Child Nursing. Skyers is an emotionally intelligent leader with a positive history of improving team morale and engagement. She enjoys building teams and is committed to a high standard of excellence in patient-centered care, nurse satisfaction, and fiscal responsibility. She has lead successful change in both the acute care and Long Term Care environment. She is dedicated to developing high quality, resilient nurse leaders, ready to lead in this ever-changing healthcare arena. Skyers received her Bachelor of Science and Master of Science degrees from Wilmington University in Delaware. 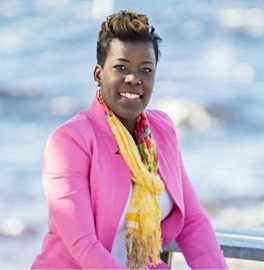 Not only does she hold an MSN with a focus in Executive Leadership, she has completed a multitude of leadership seminars, trainings, certificates and fellowships solidifying her expertise in this area. Skyers is an active member of the distinguished, Sigma Theta Tau International Honor Society of Nursing; she served as Leadership Succession Chair for her local chapter. She continues to influence the next generation of nurses by serving on the Board at local Colleges and Health programs. 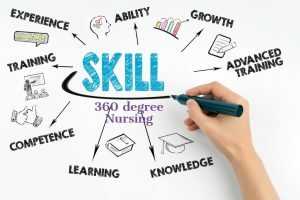 As a nurse leader, Georgia acts as a change agent, identifying the multitude of ways that clinical Managers can change the course of nursing by owning the craft 360 degrees. “Managers must have a panoramic view of the state of nursing and take ownership of the solutions.” Skyers believes that ownership is best demonstrated at the clinical Nurse Leader level where the greatest impact is felt by patients and front-line nurses. Today, Georgia is on a journey to develop and support nurses in leadership roles, and shift the culture so that they see themselves as change agents in healthcare settings. 360 degree provides leadership development programs for nurse leaders. Our programs are tailored to the individual nurse leader, ranging from the novice to the veteran. We are a dedicated team with 24+ years of experience and expertise. We understand that nurse leaders juggle competing priorities and that all are important, 360 degree will help you achieve the clarity of mind to determine your most important priority NOW. Leaders will walk away with the tools and skill needed to make each day successful. Using evidence based framework, 360 degree prepares clinical leaders to be resilient visionaries leading teams. In today’s ever changing healthcare environment, leaders change as frequently as the nursing processes change. Often times, nurse managers are selected into the role because they are ‘experienced’ nurses, not because they have demonstrated specific leadership abilities. More often than not, leaders are selected to fill a need- and with the nursing shortage, any experienced nurse will do. With this model, nurses are more likely to fail as leaders than succeed; senior nurse managers function by ‘winging it’ in order to survive. The absence of official training and coaching creates a calamity for nursing, and healthcare at large. Over time, organizations may experience devastating effects of hosting unprepared leaders. Impact can be seen in: reputation, customer satisfaction, staff satisfaction, and financial stability. Investing in leader development is a proactive approach to organizational success and sustainability. We offer in person and remote consultancy services. We perform an in-depth assessment of our clients in order to meet the unique needs of individuals, and organizations. We tailor all workshops and programs to speak to the specific needs of your organization and individual leader.